Rhubarb is spring’s own zucchini. By which I mean, even if you don’t have your own patch of rhubarb, chances are good you have a neighbor who is swimming in the stuff every year at this time, and who will eagerly foist some off on anyone who asks. That’s because rhubarb seems to live forever, and most folks who live in old houses in New England have an ancient plot that came with the deed. These well-established clumps produce a huge number of juicy pink stalks year after year without any attention at all – though they do like moisture, lots of sun and an occasional infusion of compost. Rhubarb is sometimes called the “Pie Plant,” for obvious reasons. But rhubarb isn’t just for pies. In fact, it has the kind of versatility that most other edibles lack, happy in desserts as well as savory dishes, good both cooked and raw, delicate enough to take a supporting role in a recipe, and assertive enough to take center stage. Though many people wrinkle their noses when contemplating the acidity of rhubarb, especially in its raw state, that acidity is probably rhubarb’s best asset. You might not want to eat rhubarb the way Scandinavians do – by the raw stalk, dipped in sugar – or as Chileans do – by the raw stalk dipped in salt and hot dried chile pepper. But if you think of rhubarb as a substitute for citrus fruits like lemons and limes, or as a balancing ingredient in recipes that feature rich foods like pork and shellfish, you will certainly find dozens of ways to substitute rhubarb into your favorite recipes. Below you’ll find a few recipes I’ve developed for using rhubarb in savory dishes. 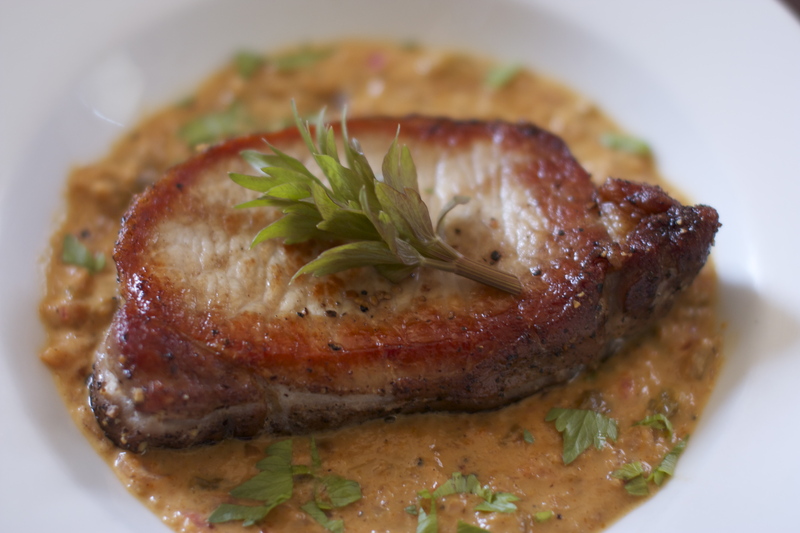 The first, Pork Chops with Orange Rhubarb Sauce and Lovage, contains another of spring’s vegetable perennials, lovage. Lovage looks like giant celery and tastes like it looks, which is to say a tiny bit of it imparts a highly concentrated celery taste. Used sparingly, it is a wonderful addition to salads, soups and other dishes. Substitute celery leaves or parsley, if you don’t have any. The second recipe uses rhubarb juice to partially “cook” fresh scallops, just as lime juice is used in seafood ceviches. The longer the scallops marinate, the more the acid will permeate the delicate flesh, and the less time the scallop will need to heat to be cooked through. If you like, scallops that have been marinated for 4-6 hours can be served cold, without the final cooking step. 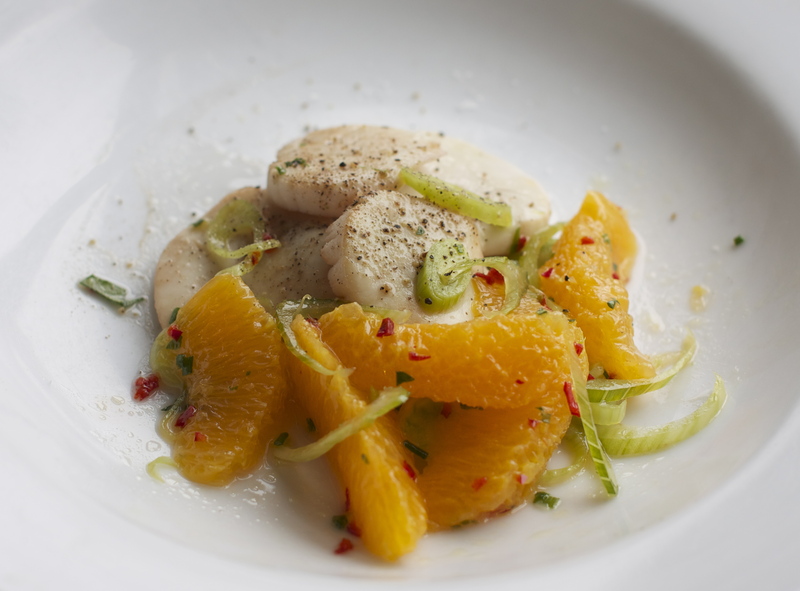 However, I prefer the lovely contrast the warm scallops create juxtaposed to the cold, crunchy fennel orange salad. The final recipe is my take on a traditional sauce for oysters, mignonette. 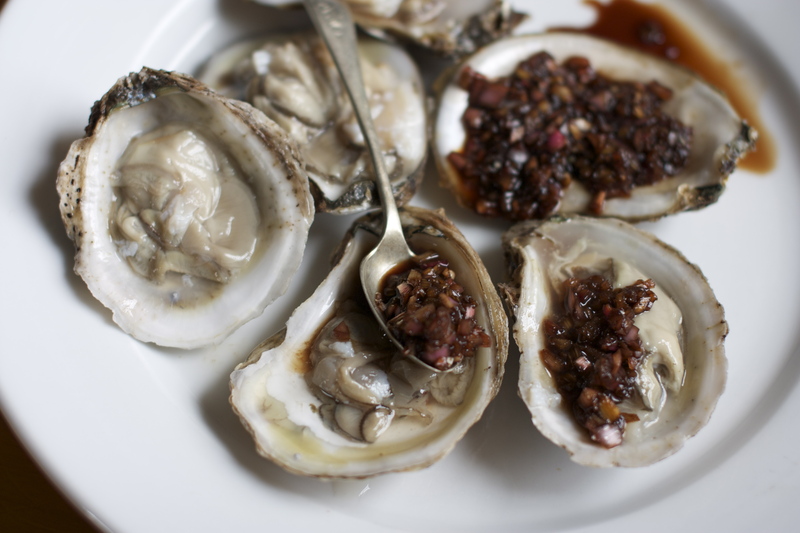 Usually mignonette sauce is made by combining red wine vinegar, minced shallots and lots of freshly ground black pepper. Here, to balance the tartness of rhubarb, I’ve substituted a mellow-sweet balsamic vinegar (buy a good one – it’s expensive, but worth it) for the sharper red wine vinegar. The resulting sauce is wonderful, not just on oysters, but with any rich food. I’m particularly fond of it spooned over a slice of crusty bread spread with a triple crème cheese, such as Saint André. If possible the day before serving, sprinkle both sides of the pork chops with salt and pepper, lay them on a paper towel on a plate, cover with another paper towel and leave in the refrigerator overnight. This dries the outside of the pork and allows it to absorb a bit of salt, which will cause the meat to brown nicely and remain juicy when cooked. Heat a large skillet over medium heat and melt the butter or heat the oil in it. Add the pork chops to the pan, working in two batches if necessary so as not to crowd the meat. When one side is golden, flip the chop and cook the other side, covering the pan to avoid splatters and to cook the meat more quickly. Thick chops will be done in about ten minutes total. Don’t overdo it, as the chops will be resting in a warm place while the sauce is prepared and will continue to cook from residual heat. When the chops are cooked, set them aside in a warm spot while making the sauce. Add the shallots to the skillet in which you have cooked the pork – if there’s a lot of fat in the pan from cooking, you may pour most of it off. Or, if there is no fat left in the pan, you may add another pat of butter or bit of oil to it before cooking the shallots. Cook the shallots until they wilt, but don’t brown them. Add the orange juice to the pan and stir well to scrape up the bits of cooked meat juice from the bottom of the skillet. Add the orange rind, rhubarb and raisins and stir well. Turn the heat down so the rhubarb simmers slowly. When it begins to break down after a few minutes, taste the mixture and add as much sugar as needed to balance the sauce. Stir in the heavy cream, taste again and add salt and pepper to taste. Divide the sauce between four plates, top each bed of sauce with a pork chop, sprinkle a little lovage over the sauce and garnish the top of the chop with a sprig of lovage. Serve immediately. Cut the tough piece of white muscle from the scallops (if necessary) and discard. Slice each of the scallops into three thin rounds. Put the rounds into a non-reactive bowl. In the bowl of a food processor, pulse the rhubarb until it is pureed (you may also use a grater to turn it into a puree). Put the puree into a fine sieve over a bowl and press on it to extract all the juice from it (you may also do this by squeezing the puree with your hands.) You should wind up with about 3/4 of a cup of juice. Pour this over the scallops, cover with plastic wrap and refrigerate for at least an hour or up to 6 hours. Discard the rhubarb solids. Wash the fennel, then slice it into very thin slivers and toss with the orange segments. Mix together the chives, parsley, olive oil, hot pepper, a little salt and pepper and set aside. Remove the scallops from the refrigerator and drain, discarding the rhubarb juice. Heat a skillet, add a little oil to it and then saute the scallops over very high heat, less than a minute on each side. The longer they have marinated, the less time they will need to cook. Arrange the scallops and orange salad on 4 plates, drizzling them with a little of the oil and herb sauce. Serve immediately. Combine all ingredients. Serve chilled on fresh oysters or other raw shellfish. The sauce is also delicious on fresh crusty bread thickly spread with butter or a soft, rich cheese, such as Saint André. Makes a bit more than 1/2 cup. 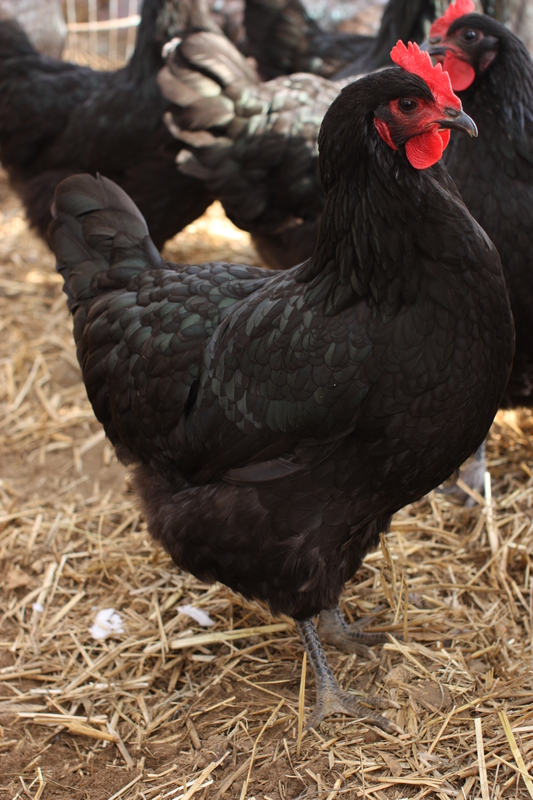 The flock of Black Jersey Giant hens I share with my sister-in-law has just turned four, and they’re still laying more eggs than our two families can absorb. Getting rid of the excess is no problem, though – actually quite the opposite. Okay, I’m going to brag a little here; forgive me. Our eggs are really good. Our chickens are true free rangers, spending most of the day outside eating bugs and greens. The proof of their excellent diet is in the egg yolks, which are calendula orange, so bright that when I make cakes with them, the batter looks as if I’ve dyed it with yellow food coloring. It turns out, according to several studies done by Mother Earth News, that the average egg produced by pastured chickens contains 7 times more beta carotene than the average conventional supermarket egg, hence the brilliant yolks. The studies also show pastured chickens produce eggs with ⅓ less cholesterol, ¼ less saturated fat, ⅔ more vitamin A, twice as many omega-3 fatty acids, 3 times more vitamin E, and between 4 and 6 times as much vitamin D.
Here are two egg-rich recipes. 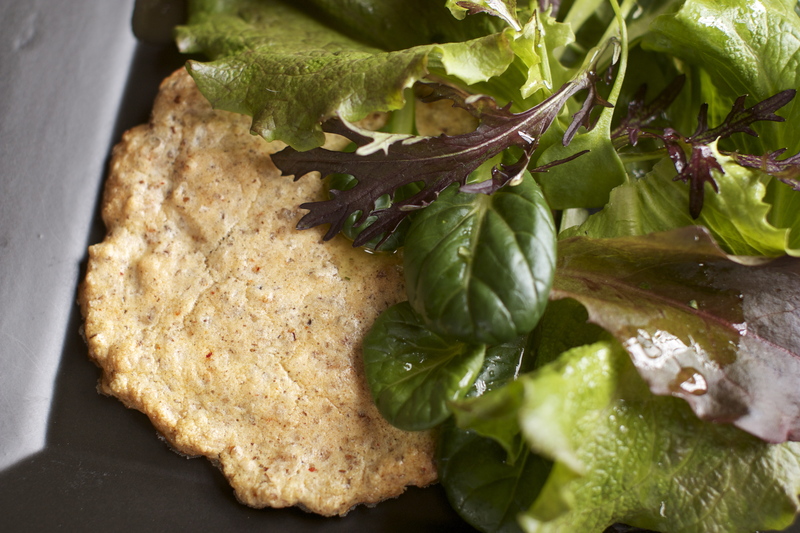 The first is for a whites-only nut and cheese meringue cracker that’s a delicious contrast to spring greens. 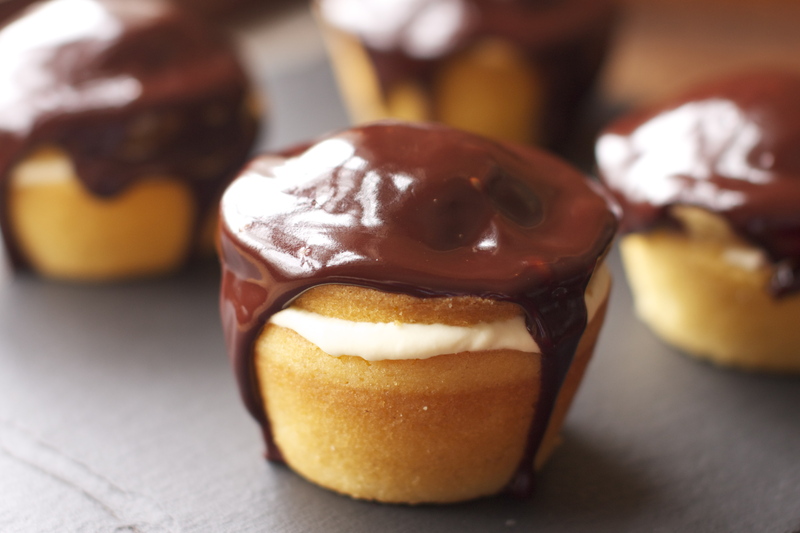 The second recipe is a good way to use up the leftover yolks, Boston Cream Cupcakes, light enough that you’ll want to eat two, but rich enough that you should probably only eat one. The pastry cream recipe makes more than you’ll use filling the cupcakes, but it’s delicious on its own or topping fresh berries or stewed rhubarb. Preheat the oven to 300 degrees. Line a half-sheet tray with parchment paper; butter and flour the parchment. Set aside. Place the pecans, cheese, salt, and peppers in the bowl of a food processor and pulse until the nuts are finely chopped. Be careful not to pulse so much the mixture turns into a paste. In the bowl of an electric mixer whip the egg whites and the pinch of cream of tartar using the whisk attachment until the whites form soft peaks. Fold the nut mixture into the whites carefully, trying not to deflate the whites completely. Spoon the batter evenly into 8 spots on the prepared parchment, leaving lots of space between the spots. Use a spoon to flatten and spread into approximately 4 inch wide rounds – don’t let the rounds touch. Place in the oven – if your oven has a convection fan, turn it on as it will speed the cooking process. Cook the meringues until they are just golden brown, about 25 minutes. Turn off the oven, but leave the meringues in it and leave the convection fan on. After 1/2 hour, remove the tray from the oven and allow the meringues to cool completely. To serve, place each meringue on a plate. Toss the greens with the dressing, then top each meringue with greens. Serve immediately, before the meringues get soggy. In a small bowl, whisk together the lemon juice, vinegar, salt and minced garlic. Gradually whisk in the oils, dribbling them in slowly so the mixture emulsifies. When all the oil has been added, whisk in the herbs. Makes about 3/4 cup. Preheat the oven to 350 degrees. Combine about 1 tablespoon of softened butter with about 1 tablespoon of flour to make a smooth paste. Use this mixture to grease the cupcake molds evenly and thoroughly. Place the dry ingredients in the bowl of an electric mixer and stir gently with the paddle to combine. Add the butter a few chunks at a time while mixing gently. As the butter is cut into the dry ingredients, add more butter until it is all mixed in. You should wind up with a mixture that resembles coarse cornmeal. Add the eggs, one at a time, combining well after each addition. Finally, add the milk and vanilla. Beat well a minute or two until light and fluffy. Divide the batter evenly between the 12 cupcake impressions. Place in the oven and bake, turning once for about 20 minutes. The cupcakes are done when they have risen and spring back when touched in the center. A toothpick inserted in the center of a cupcake will come out clean. Try not to over-bake. Let the cupcakes cool a few minutes before gently lifting them onto a cooling rack. Let them cool completely before filling and frosting. To fill, cut the top off each cupcake and use a small sharp knife to cut a cone shape out of them – leave enough cake on the bottom and sides so that the cupcake doesn’t fall apart. Fill the cavity with pastry cream, enough so that a little squeezes out the side when the top is replaced. Spread the top of each filled cupcake with some of the chocolate frosting, enough so that it drips down the side. Chill the cupcakes until they set, then serve. Makes 12. Have ready a sieve fitted over a clean bowl, a whisk, and a wooden spoon. Place the milk in a medium saucepan. If using the vanilla bean, split it in half lengthwise and scrape the seeds into the milk. Add the bean halves to the milk along with about ⅔ of the sugar. Heat the milk over medium heat until it is just about to simmer. Meanwhile, place the yolks in a medium bowl and whisk in the remaining sugar. Continue whisking for about a minute, until the yolks are lighter in color and a little thicker. Whisk in the sifted flour. When the milk is hot, lower the heat beneath it. Temper the egg yolks by scooping out about a cup of the milk and pouring it into the bowl of egg yolks, whisking constantly. Add another cup of the hot milk, whisking constantly. Finally, pour the tempered egg yolks into the pot of hot milk, whisking constantly. Heat the mixture over low, stirring constantly with a wooden spoon. Scrape the the pot with the spoon to incorporate the thickening mixture on the bottom back into the thinner mixture on top. 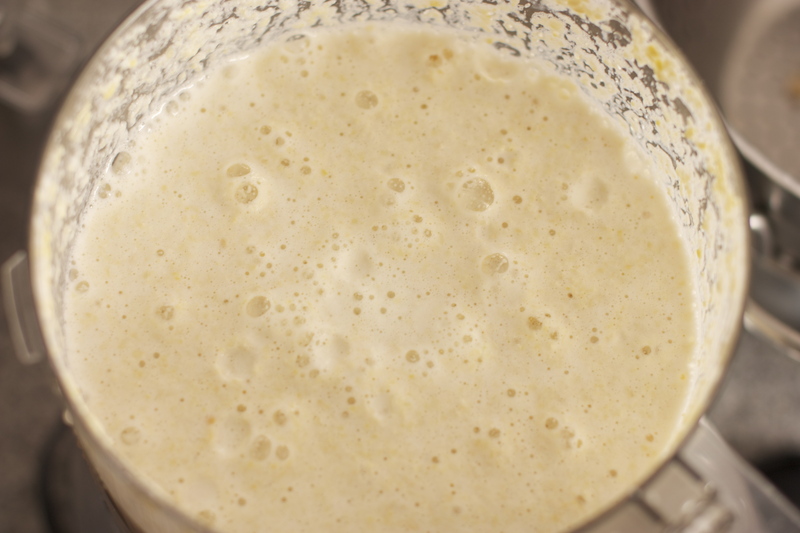 Occasionally whisk the mixture briskly to break up lumps. Continue cooking the mixture, stirring constantly, until it just barely begins to bubble; it should be very thick. Pour the pastry cream through the sieve into the clean bowl. Stir the cold butter into the pastry cream until it melts and is completely incorporated. Place the bowl of pastry cream in a cold bath of ice and water in a larger bowl being careful not to let any of the water get into the cream. Cover the surface of the cream with a piece of plastic wrap to keep a skin from forming on it as it cools. When the pastry cream is cooled, you may place it in the refrigerator for up to a day before proceeding. When the pastry cream is completely cold, place the whipping cream into the chilled bowl of an electric mixer and whip with the chilled whisk attachment. Whip the cream until very stiff and thick, almost to the point of over-whipping. Fold the whipped cream into the cold pastry cream and use to fill the cupcakes. Combine the first three ingredients in a small pot and heat over a low flame microwave. Stir gently until the chocolate has melted and the mixture is homogenous. Remove from heat and stir in the butter until it has melted and is incorporated. Allow the mixture to cool a little before using to frost the cupcakes. Makes about 1¾ cups. One of my favorite restaurants in New York City is Kyotofu in Hell’s Kitchen. I’d walked by the place for years and hadn’t been tempted to go in – a restaurant based around tofu just didn’t hold much appeal for me. But one day when my vegetarian son was fed up with pizza and Chinese food, we decided to give it a try. Which is how I discovered that freshly made tofu is as different from the store-bought variety as a fresh loaf of crusty sour dough is different from Wonder Bread. My favorite dish at Kyotofu is a pristine white mound of silken tofu (made daily in the restaurant) served with three different sauces, olive oil and tomato, soy and sesame, and kuromitsu (made from unrefined brown sugar). The dish is simple and perfect – the cool, ethereal tofu balanced by the dark, earthy, flavor-packed sauces. wonderful appetizer. It turns out that making silken tofu is easy, and that yes, my homemade version was as good as Kyotofu’s. It does take a little preparation, however. Silken tofu only contains three ingredients: good water, good dried soybeans and food grade gypsum (calcium sulfate). It’s not worth making unless you have the best quality of each on hand. big, yellow-skinned and very fresh, but they aren’t organic as far as I can tell. The ordering process was simple using a credit card and the beans arrived here in New Hampshire in under a week. The first step in making silken tofu is to make rich soy milk. 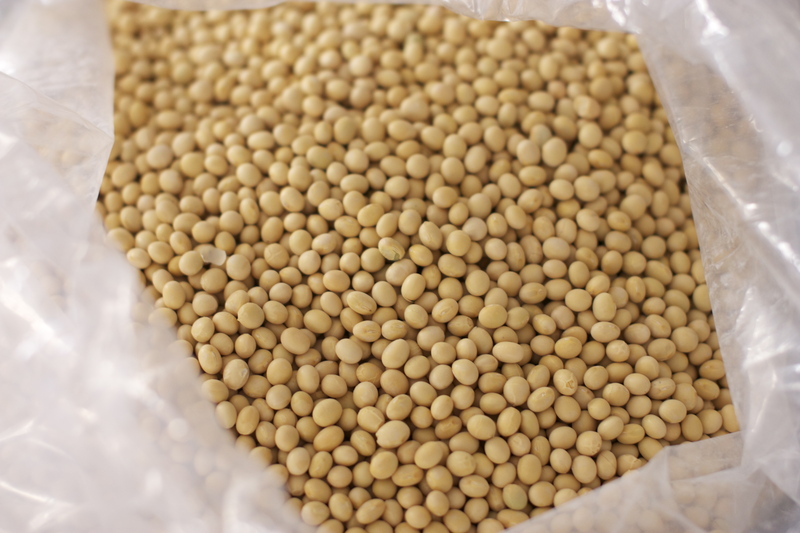 The soy beans are soaked overnight until plump, then ground with water in a food processor or blender to a thick slurry. This is then heated with more water, strained, and heated again (soy needs to be cooked throughly to make it digestible). The milk is then cooled and mixed with gypsum, which acts as a coagulant. This mixture is then gently steamed until it sets. The cooked tofu is refrigerated for several hours, after which it is ready to eat. One trick I learned from Nguyen is that ingredients like citrus rind and maple syrup can be mixed into the soy milk before it is steamed. The results are like no tofu you will ever buy from a grocery store, good enough to turn even tofu-haters into tofu lovers. The recipes below are based on those in Asian Tofu; if you like making things from scratch, I recommend you pick up a copy or take it out of your local library (though be warned, it is not strictly vegan or even vegetarian, though it does contain both sorts of recipes ). And while you’re at it, look for Andrea Nguyen’s other cookbooks – they’re all terrific. very small pieces. There should be no large pieces or whole beans left in the mixture; it will be quite pale and fluffy. Pour the mixture into a large pot. Swirl 1½ cups of water in the bowl of the food processor or the blender to coax out any remaining bean puree, then add this to the pot. Turn the heat to low and, stirring frequently to keep the bottom of the pot from burning, bring the mixture to a simmer. 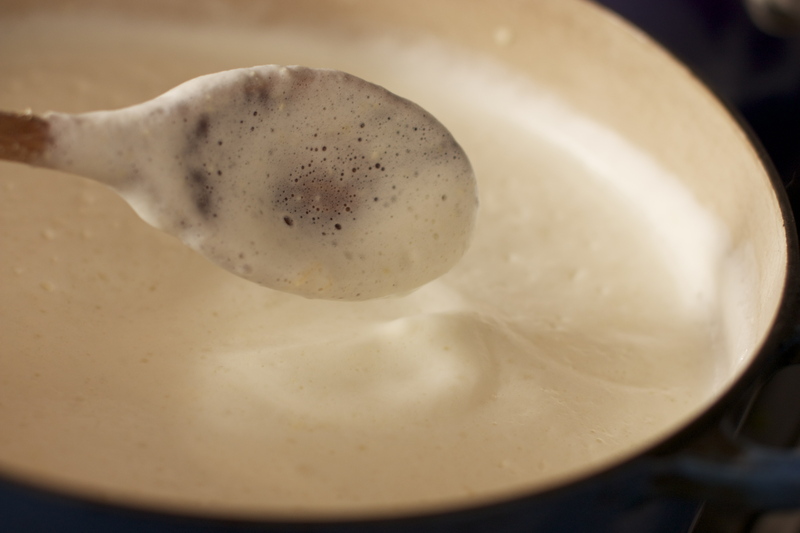 A white froth will float on top of the mixture, which makes it a little hard to see if the mixture is simmering or not, so peek beneath the froth from time to time to check. When the mixture comes to a simmer, let it bubble for several minutes, then turn off the heat. Allow the mixture in the pot to steep off the heat for 5 or 10 minutes, while you prepare the strainer. Rinse the muslin or other liner with cool water, then line the strainer with the wet cloth. Place the strainer over a large bowl or pot to catch the soy milk. Scoop the hot soybean mixture into the lined strainer, pressing down hard on the pureed beans (the “lees”) to extract all the milk from them. When all the liquid has drained, twist the top of the cloth closed and squeeze as much more liquid as you can from the lees. Finally mix about 1/2 cup of water into the lees and give them another squeeze. (The leftover lees can be added to soups or stews, or stir-fried with vegetables. In Japan they are often sold as animal feed – my chickens love them). Return the milk to the pot (be sure to rinse it out first) and bring it to a simmer over low hit, stirring often to prevent scorching. Let the milk bubble slowly for five minutes, stirring occasionally. Pour the milk into a clean container (a metal bowl is good, because it helps to cool the milk quickly). Allow it to cool to room temperature, then refrigerate until cold. flavorings, if desired, such as grated orange or lemon rind (use organic fruit and wash well), maple syrup, etc. Put enough water into the pot so that it comes up to just below the steamer rack; put the lid on the pot. Turn on the heat and bring the water to a gentle simmer. Meanwhile, combine the gypsum with about 2 teaspoons of water – just enough to make a paste. Stir the gypsum slurry into the cold soy milk and stir very well to combine completely. Divide the soy milk between the ramekins (how many you need will depend on their size – probably around 5 or 6). At this point, you may add flavorings to the soy milk, such as a teaspoon or two of maple syrup or a pinch of freshly grated citrus rind. Place the ramekins on the rack over the gently simmering water and return the lid to the pot. You may need to cook the tofu in batches, but that is fine. The tofu is done when it is set and no longer liquid in the center. How long this takes will depend on the size of your ramekins, but will probably be 15-20 minutes. A skewer inserted in the center of the tofu will leave a small hole behind when they are ready. Lift the ramekins from the rack and set them on a tray to cool to room temperature. Cover the cooled tofu with plastic wrap and refrigerate for at least two hours before serving. To unmold, run a knife around the sides of the ramekin to loosen the tofu, place a plate on top of the ramekin and invert. You may also serve the tofu in the ramekin. 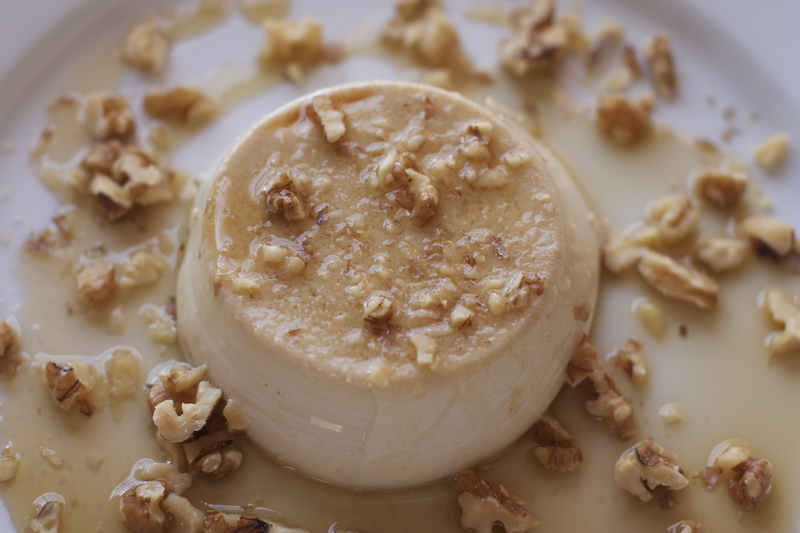 These ramekins are delicious with warm maple syrup and toasted walnuts. 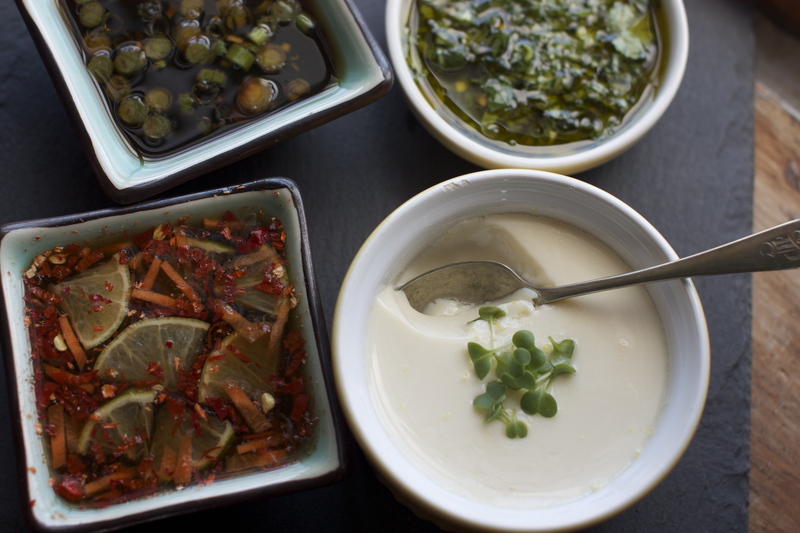 Or, serve them in Kyotofu’s style with three dipping sauces. 1/4 cup soy sauce, 1 teaspoon toasted sesame oil, 1 teaspoon maple syrup, 2 tablespoons water, 2 chopped scallions. *Many people in NH rely on wells rather than municipal water supplies, and sometimes the wells provide water that’s a little too full of iron, or even arsenic. Which is why locals always know where there’s a good spring from which to collect pristine water. You’ll see people by the side of the road with empty gallon jugs, holding them under an endlessly gushing pipe. No one ever seems to know who put the pipe there, who it was who decided to share that bountiful spring, because it happened a long time ago. Talk about paying it forward. I’m pretty sure no matter how much of a jerk that person was in life, sharing that water supply was enough to get him or her into heaven. March is the month when gardeners begin starting seeds inside and eating the last of the vegetables stored in their root cellars. They’re called “root” cellars for a reason, because roots, like carrots, rutabagas, storage radishes (such as daikon) and beets, are what keep there best. This is because most root vegetables are designed for a winter of storage below ground. They’re biennials; that is, they live for two years. The first season, they turn out leaves above ground for photosynthesis, and large swollen tubers below ground in which to store energy for the following year. If left in place or replanted in spring, these tubers would send up flowers in their second year of growth, go to seed, and, having reproduced successfully, die. At the end of the winter, stored root vegetables have a remarkable ability to tell that their second growing season is approaching. They sprout new leaves and use up their stored sugars, going limp and bitter. It’s time to use them up and seed in new plantings. This recipe is based on one in Maricel E. Presilla’s great cookbook, Gran Cocina Latina. It’s an interesting use of quinoa – as the crust on fried chicken fingers. 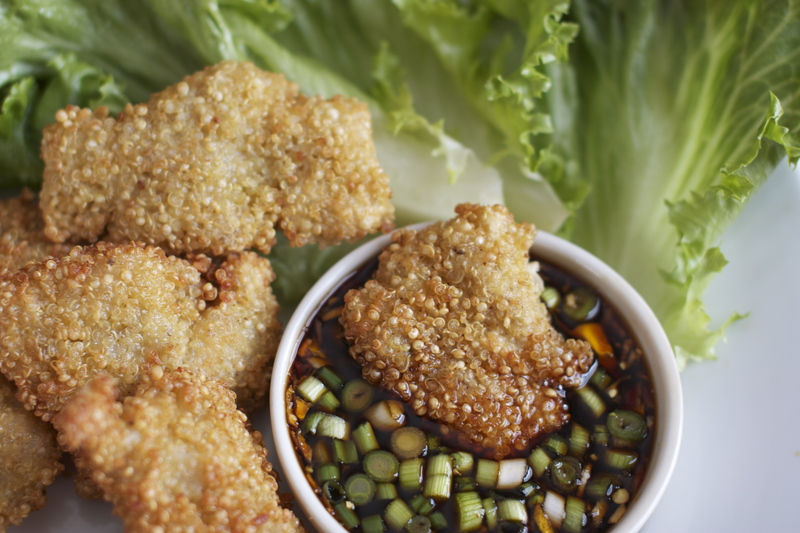 They are delicious,especially with the dipping sauce, and they stay crisp for a long time.